The 100-year-old two-story building, located at 2129 Central Ave., which was the former home of Toad Hall Antiques, has been sold to a group called Central Cooper Gateway Inc. When Central Gateway Incorporated made Dana Whitehead, Toad Hall owner, an offer “that was too good to pass up” she made the decision to move and have a sale for her loyal customers. The head of the company, Charlie Ryan, owns other retail properties in the neighborhood such as Urban Outfitters at 2151 Central Ave. Central Gateway Inc.’s intentions for the building will be to lease it out for retail, maybe clothing, but nothing is definite yet. “The building will be rented and fixed up,” Ryan said. Some employees at other surrounding stores in the Cooper-Young area said that turning the building into something else will be good for the neighborhood. “I think if they put another retail store there it would bring more people and business into the neighborhood verses an antique store,” said Natalie Bill, an associate at Wish at 2157 Central Ave.
Whitehead said her last goodbyes on Feb. 28. She has moved out of the Cooper-Young neighborhood to open a new location in Gulf Breeze, Fla.
“Moving is a bittersweet feeling. I’m going to miss my costumers and all the great people I’ve met.” Whitehead said. North Carolina native Whitehead initially moved to Memphis to work for a hotel. 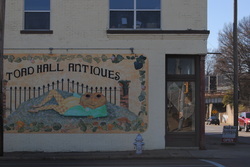 After one-year in the business she resigned and took over the Memphis Antique Market. She worked there for three years before moving. “I knew the owner was selling the store so she let me buy the business and I’ve been doing it ever since.” Whitehead said. Toad Hall Antiques opened in February 2003. When she was looking for a name for the store she decided to name it from one of her favorite books “The Wind in the Willows” by Kenneth Grahame. Whitehead said she loved the Cooper Young neighborhood and hated to leave it. She said it is a one-stop shopping neighborhood where the people can eat, shop, and play. “Love It. There is nothing better than Cooper-Young. I love the residents and the restaurants,” Whitehead said. Whitehead said that the best part of owning her store in the neighborhood was the people and that she has the best costumers. Business has been great for her. “We have just finished one of the best Christmas seasons we’ve had in years.” Whitehead said. Even though she is sad about leaving she is ready for a change but she didn’t think it would happened this fast. Whitehead will be opening a Toad Hall Antique store in Florida and taking the merchandise that she doesn’t sell along with her. “Since a lot of my costumers travel and vacation in Florida it will be nice to see them when I can,” Whitehead said.